I would like one of these for Christmas, please – and by one, I mean the older gentleman. The Ferry boys: making spirits bright, this Christmas. 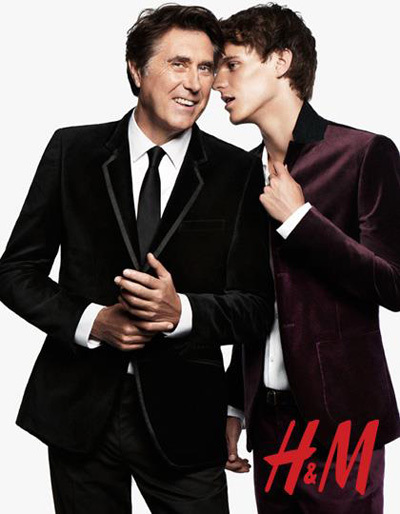 Bryan Ferry and his son Tara were featured as part of H&M’s holiday campaign. You know the one – it’s that cover of Girls on Film that is playing everywhere. God rest ye Ferry gentlemen. I had a date with both of them tonight – had tickets for Bryan’s Shepherds Bush Empire show, but couldn’t make it over to London in the end. Tara is drumming up family business, touring with his dad’s band these days. They have one more show in London on the 15th. Maybe we’ll all hang out at some point in 2012, dressed for the thrill of it all? Images by Inez van Lamsweerde and Vinoodh Matadin, courtesy of Select Model Management. More rock star offspring antics. More boys and girls on film. Next Post London Lament: Is Your Love Strong Enough?